The Be24A includes in a standard DIN 96mmx96mm module, all programmable functions needed to control an engine and generator. The Be24 features 6 membrane-type push buttons, 2 LEDs, a 4 digit display, 5 static outputs, 9 inputs, and a 3-position (30A rated) Key-switch for manual start. 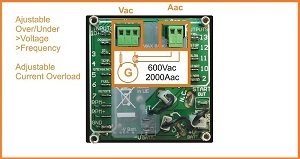 By adding 3 automotive type relays you can make a reliable but cost-effective generator auto start. If you are more confident in using the key, there you are the connection. We respect your opinion! 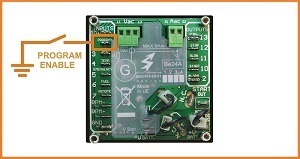 Be24 provides the '50' terminal to drive directly the starter motor pilot relay. 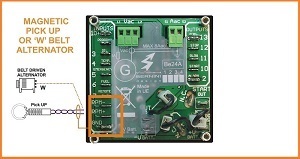 Be24 can measure the rotational speed from the frequency of the alternator. But adding a pick up or using the 'W' of a belt driven alternator, you will get more security. Be24 monitors voltages up to 600VAC and current up to 2000A. You are required to use a /5A CT and to provide a fuse to protect the cables. You can set Over/Under V/Hz and Overcurrent as well. Be24 features positive logic outputs short circuit proof. You are required to put diodes in parallel to the relay coils. This will avoid electric noise. Do not exceed 200mA on each output or coil resistance below 90 OHM. Be24 interfaces with digital inputs. Some inputs have N.C. (Normally Closed) and N.O. (Normally Open) options to adapt the controller to your application. Inputs are very well protected against over voltages and spikes. Be24 features adjustable settings. To protect your controller from un-authorized access we recommend that you remove the connection of the program enable terminal after programming. This generator auto start has a special circuit that provides excitement to the belt alternator (about 3W) and in the same time provides a proper crank termination for the electric start motor. Do not leave this terminal un-connected. You can start the engine from a remote location by using a simple switch. In this generator auto start you can program the option N.C.or N.O.. 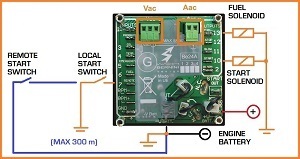 It is mandatory to connect one side of the switch to battery minus. Avoid to connect the terminal to a remote 'ground' point. b) if the KEY-SWITCH is in the ON position, the Be24A enters the AUTO mode. That is, if the Be24A was in AUTO prior to the supply removal. If not, the Be24A enters the MANUAL mode. The OFF mode clears the alarms and turns the Display off. To select the OFF mode, turn the KEY-switch to off. In the OFF mode you can read the settings or program the controller (see sections 6.0 and 11.0). The Be24A operates according to the parameters indicated in section 11.0 of the OEM user manual. The Be24A initiates the starting of the engine if the ‘REMOTE START' input energizes or if parameters [P.26]-[P.27] have been programmed (SCHEDULER). B) - push the AUTO push button, then the Be24A will indicate [uuuu] (Pre-glow cycle) or [StA-]; the yellow Led ‘AUTO’ also illuminates. If the REMOTE START input is not activated, the yellow LED blinks. 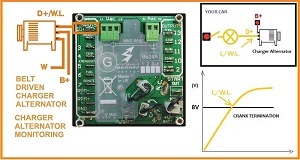 If activated, the yellow LED illuminates continuously and a start cycle will take place after an adjustable delay period ([P.0], see also section 9.0 of the OEM manual). C) - To exit the AUTO mode, push the AUTO push button (the yellow Led turns OFF) or turn the KEY-switch to OFF. If Automatic Periodic Test is triggered, the display indicates the message [tESt] (see application note in section 19.0 of the OEM manual). 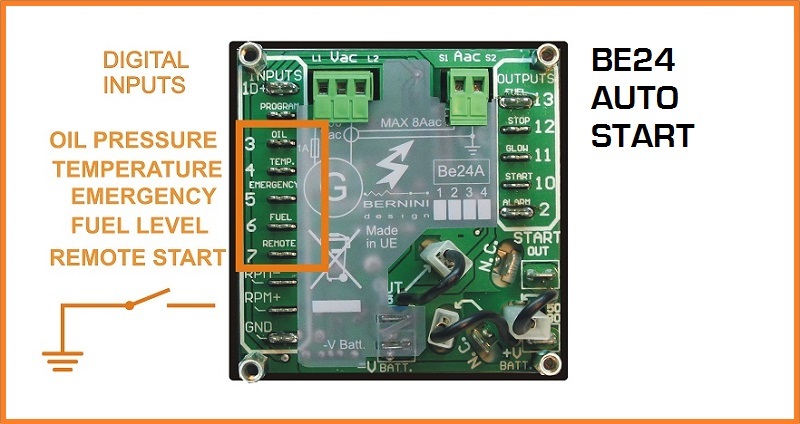 The Be24A stores the AUTO operating mode in the memory; if the battery supply then fails and restores, the Be24A will enter the AUTO mode automatically. To clear the memory of the AUTO mode, push the AUTO push button, or turn OFF the KEY-switch. A) - Turn ON the KEY-switch; the Be24A illuminates the LEDs and Display. B) - If the display shows the message [uuuu], the Be24A is counting the PRE-GLOW time ([P.13]/[P.14]); wait until the message disappears. C) - When the display shows the message [StA-] turn the Key to START position until the engine starts. The Be24A indicates [ . . . .] during cranking. D) - To stop the engine, turn the KEY-switch to off. (**)NOTE: The Be24A shows the [StA-] message for 20 seconds. After this time, if the engine does not start, the Be24A shuts down the FUEL SOLENOID and displays the message [FAIL] (Fail to start, see section 4.07 of the OEM Manual).To clear the alarm, turn the KEY-switch to OFF. 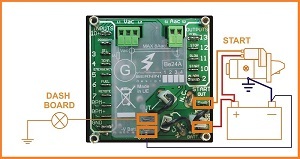 - wait for the desired start time (external clock reference) and apply the power supply to the Be24A. The Be24A will start the engine after the programmed number of days (P.26). The engine will run for the programmed time (P.27). 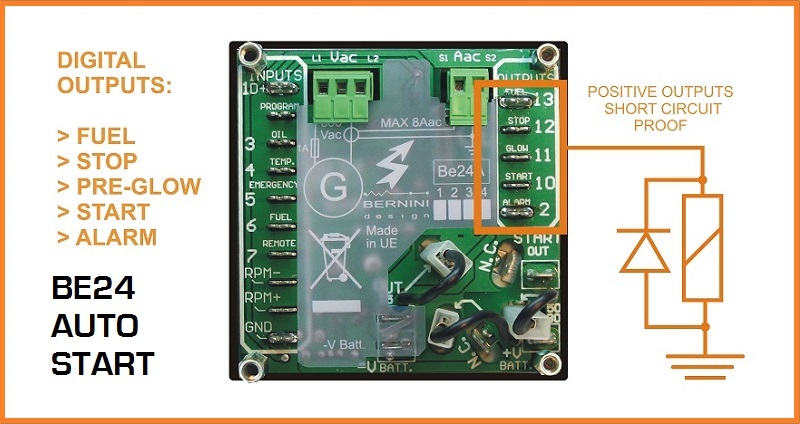 If the battery voltage is removed, we recommend that you synchronize the ‘Power On’ of the Be24A with an external clock. The Be24A shows the remaining time to trigger the test: push the [ENTER] pushbutton while Be24A is in AUTO operating mode. The display will indicate days followed by hours ([DD.hh]).